Danilov & Partners announced today that it has been ranked among Moscow’s top recommended firms by The Legal 500 Europe, Middle East & Africa 2016 edition in the category of corporate, commercial and M&A. 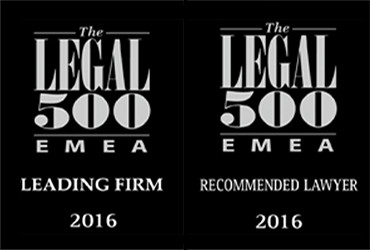 In addition, both Andrei Danilov and Brian Konradi were individually recommended in The Legal 500 Europe, Middle East & Africa 2016 editorial. “We would like to express our gratitude to our clients for their support. We are honored to have this recognition in only our second operating year. This recognition wouldn’t be possible without our client’s trust and feedback,” said Andrei Danilov, a founding member of the firm. For questions, please contact Veronica Afanasyeva, Business Development Manager at vafanasyeva@dk-legal.com.